May 5th The Bat and I decided to take a little adventure and see how much of it we could ride. We both had on just stupid clothing for any kind of adventure. I think both of us were wearing shorts and polyester shirts, the kind that like to snag on everything. Even after we hit some decently thick rosebushes, the Bat was still game so I was too. We carried our bike over several logs and carried them across a super rickety bridge but, for the most part, we were able to follow some kind of trail. 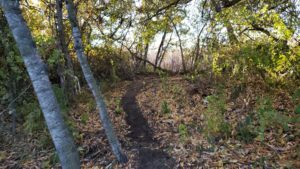 The next day I contacted the Trails Committee and one of them talked to Parks and Rec who was actually over the park. 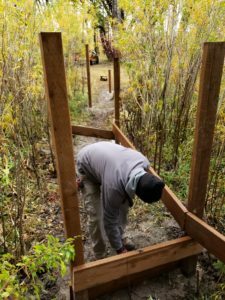 I hadn’t actually spoken to them yet but word came back that I could improve the existing trail as needed. I was stoked. 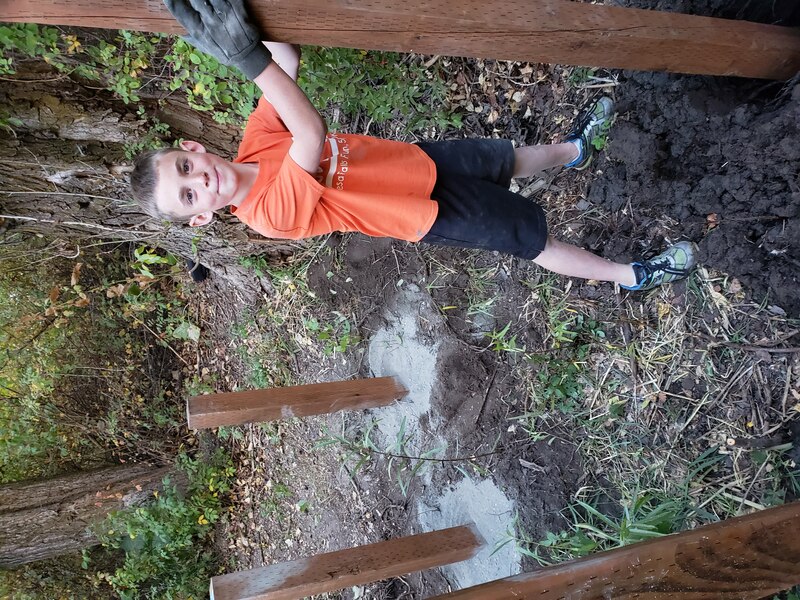 I’ve got scouts that need service hours,I know scouts that need Eagle projects, and it was clear that I wasn’t going to get to build a bike trail in my actual backyard. About 2 weeks later, I went back to find it pretty flooded. I spent a few hours clearing rosebushes which was a couple hours more than I’d planned. I got one whole section of the trail kind of clear. The next time I visited, it was more flooded. The bat and I cleared some more trail but we couldn’t really do much more. The bridge was uncrossable and other sections were entirely under water. For the next few weeks or so, I’d ride through on the road and see where the water is but it was no use. It was always under water. 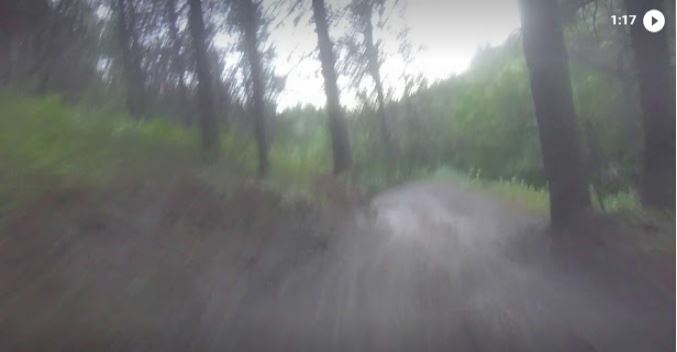 The spring runoff was way more than it usually was and I didn’t know how long it would be until the park dried up enough to ride again. There was plenty to do and plenty to ride that wasn’t under water so I kind of forgot about the trail for awhile. 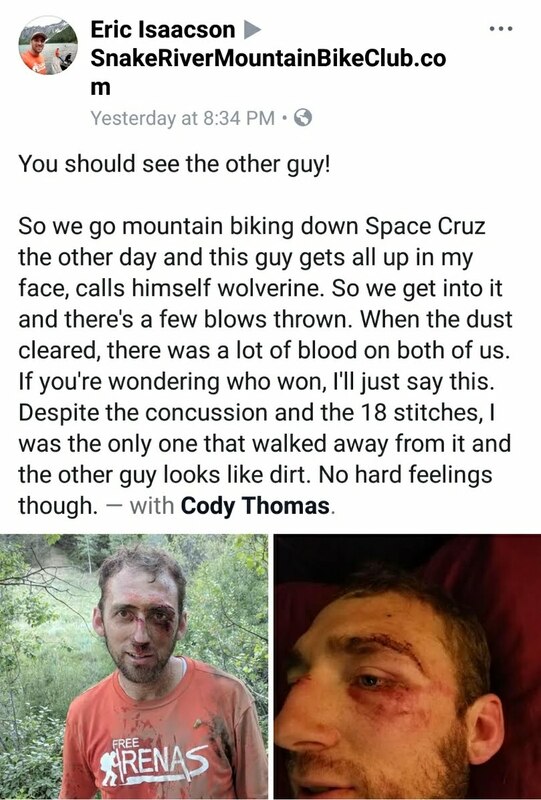 July 12th I was riding a favorite trail with a couple of my brother-in-laws, acting like I was a downhill racer, and I went down hard. I walked away from it–I had to walk a mile out– but I had a concussion that forced me to slow down considerably. It was one of those moments where you realize you’re not invincible. I was determined to get back out there but willing to take a short break and heal right. I don’t know if I’d really forgotten about the trail or if it was a weird amnesia thing but I remember it like it was an epiphany about something long forgotten. Oh ya, the trail! 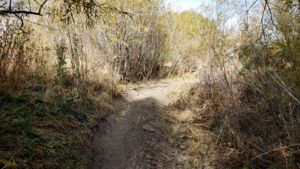 I was in no shape to be acting like a downhill racer and the trail was no longer flooded so it was time to get back to work. I took the Spud and the Bat with me to move some dirt. We didn’t ride much but we moved a lot of dirt, building up berms and even some jumps (which proved to be lame and useless). July 31st I took my scouts out one week to do some service clearing the trail. That’s when it really became rideable. I borrowed a chainsaw (for the scout service project of course), got a donation of roundup from Mayor Merrill, and brought out the weedeater for the first time. We got all the rest of the big stuff out of the way and killed weeds on almost half of the trail. 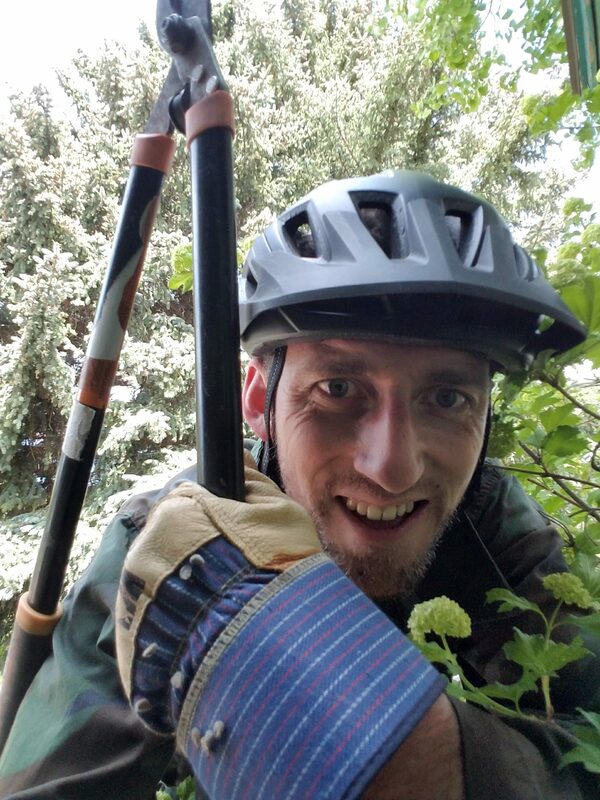 The Bat and I finished the weed killing and did some more digging and the next week, my scouts came and rode the trail. It was fun to share it. Some of the boys were barely willing to get on their bikes and have since wanted to ride bikes all the time. The bridge improved slowly over the next month or so. 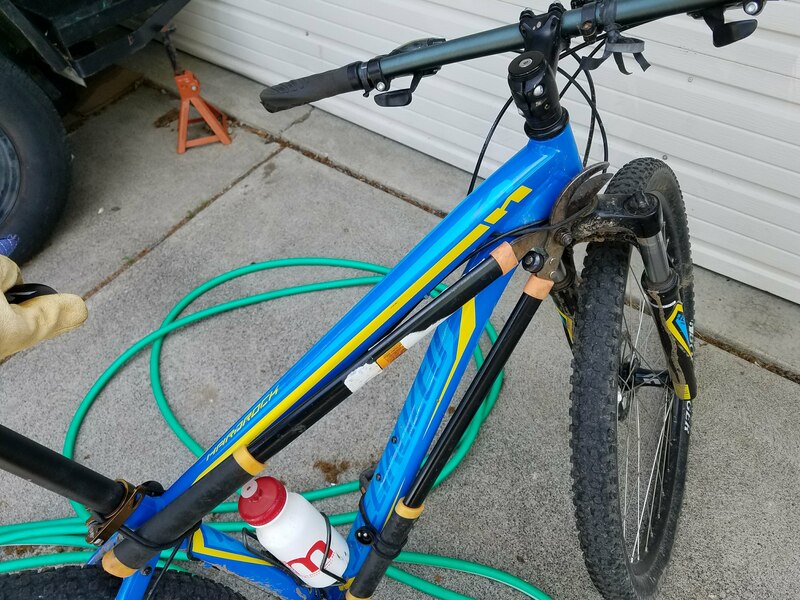 Aug 29th I got an email from Strava telling me somebody had stolen my KOM on the trail! Despite that being one of two KOMs I had, I was so excited! That meant somebody else was riding the trail. From his post, he looked pretty excited about it too. 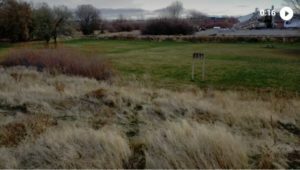 I submitted some requests and proposals to Parks and Rec about putting in a bridge and establishing a real trailhead but hadn’t really gotten anywhere. Then one Monday, we went to Eagle Park for a family photo session. Afterwards, Katie agreed to walk the trail with me. We saw some mountain bikers coming out the end of the trail and I was pretty excited. They took off before I could talk to them but a little further down the trail we saw a whole line of mountain bikers. As we stayed on the side of the trail, one of them shouted that there were about 40 of them behind him. It could have been frustrating that we had to wait for so many but I was elated. It was the High School mountain biking team doing their Monday evening practice. Now the trail was getting some use.It was great to see so many bikers on the trail. It wasn’t so great watching them all go across the nicely manicured grass area. Oct 2nd I decided I couldn’t wait for approval. We needed a trailhead. I also felt like time was running really short for being able to build the bridge. I couldn’t wait for an Eagle Scout candidate to do it. I got to work designing it myself. My kids were out of school for the week so I took the Spud and Bat to work on the trail. We spent almost all morning there but we found an option that wouldn’t require us to remove any established trees/bushes. We got the hard part done and I went back and finished defining the connection to the trail later. 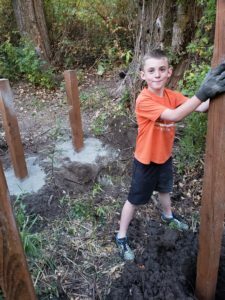 After digging the trailhead, kids still in toe, I went over to Parks and Rec and talked to my contact there about the bridge. He was tough to get ahold of and here I was, face to face with him. I didn’t want to waste that. I showed him my plans, he approved the cost, and later that day he went with me to BMC to buy the lumber we needed. That night, the Bat and I went and ripped out the other bridge. This thing was happening…and fast. 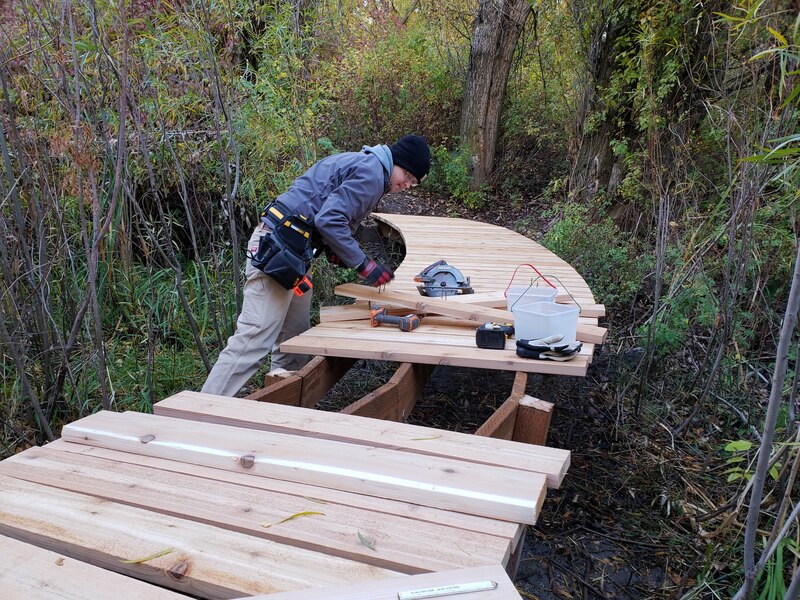 My friend John offered to help with the bridge. He seemed pretty excited about that. I was pretty excited about not doing it by myself. The day after we cleared the bridge the Bat, John, and I set the posts. Nine days later, the bridge was finished and ready to ride. 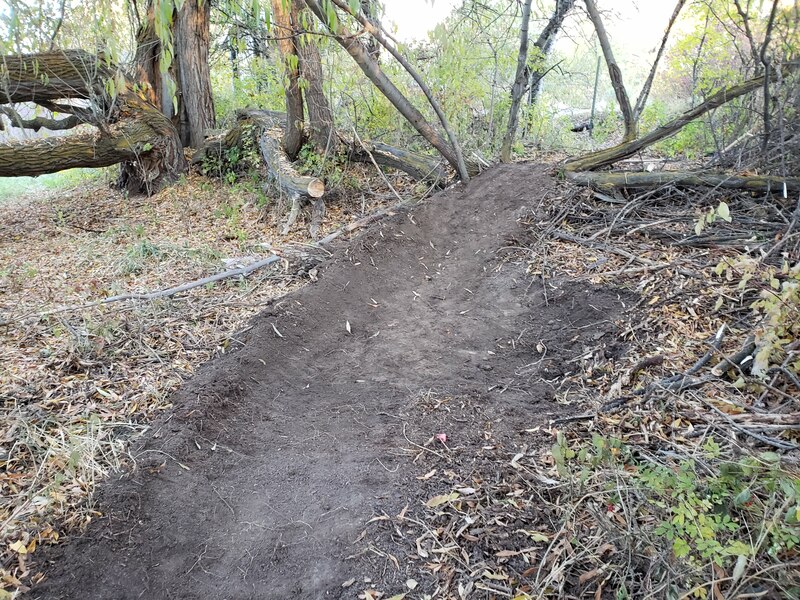 The bridge spans about 45 feet and corners beautifully with a slight grade deemed mild enough to make a good foot bridge but also enough to make for an easy corner on a bike. It’s all treated lumber except the decking which is 2×6 cedar. It cost $1705.74 which the City of Rexburg was good enough to pay for. Not being an Eagle Scout myself, I joke that this was my Eagle Project, just finished a little bit late. After all, I consulted with an engineer, got city approval and funding, had volunteer help and of course, volunteered my own time as well. Katie was pretty excited for the bridge to be done because that meant the bridge was finished. I’m not sure what “finished” means but we were far from done with the trail. In fact, adding the bridge created a lot more work. The trail had ended about 75 yards before the old bridge as the bridge was impassable anyway. Building the bridge opened up that 75 yards, plus the trail I first cleared through the canopy on the other side of the bridge, plus the entire rest of the campground of potential trails. Almost immediately after finishing the bridge, we began work to get the trail to go past (or over) a very large tree that stood very much in the way. The next cool feature was in the works. After the bridge, I felt an even more pressing need to wrap things up. 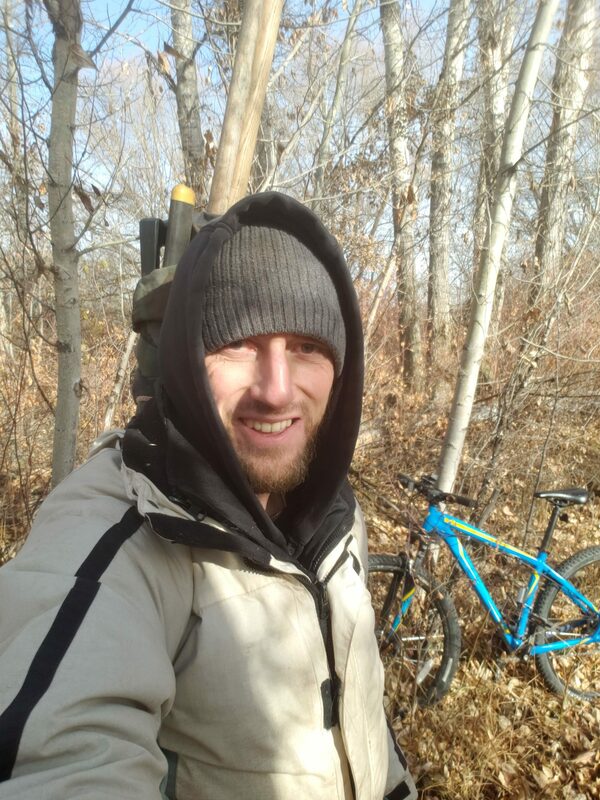 It was getting colder every day and I knew that winter could hit any day and bring the end of the trail until spring. I would get out there between 6:30 and 7:30 and work on it until 8:30 or sometimes as late as 10. It had become my morning workout and a transition point for my fitness. I usually try to switch it up with upper body days and leg days but it’s usually more like seasons than days. I hate doing leg days in my little home gym and I love to ride bikes and run in the summer. That way I get a pretty hearty upper body season and a pretty serious leg season as well. Digging trails added a great shoulder and back day into the mix. If I manage my time well enough, I can even get in a few minutes of cardio with a quick ride. 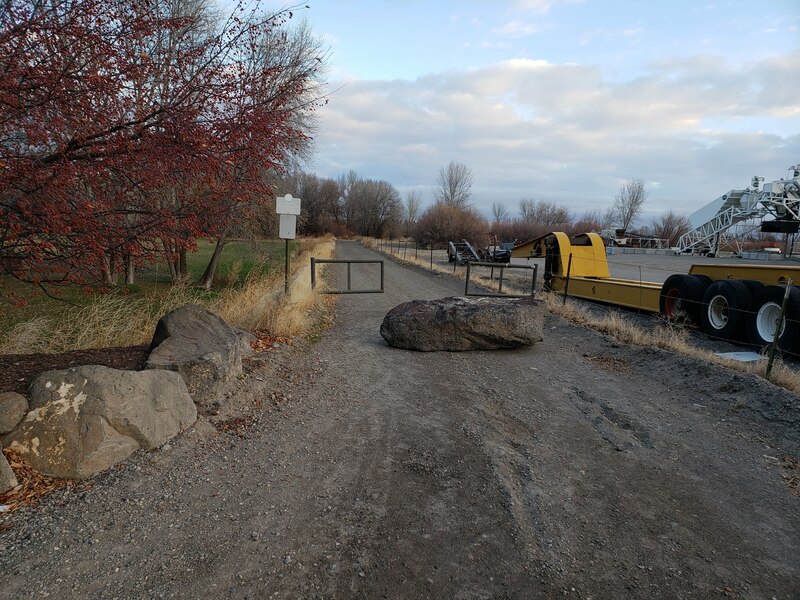 One day I went out to work on the trail, joined by Chris who had offered to help, and found the road gate closed and blocked with a large boulder. While we could still ride the trail, it did make it more difficult to haul tools in to where we wanted to work. So while Chris built a new jump near the trailhead, I spent some time digging out some sledding and snowboarding runs. The next day, I found that somebody else had added some of their own features. 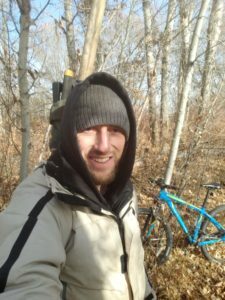 After some checking, it wasn’t anybody I’d been collaborating with about the trail so again, I was a weird kind of excited and apprehensive. 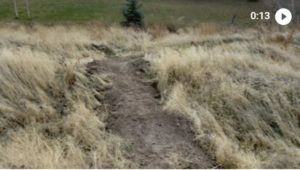 While I liked the new features and the fact that somebody likes it enough to contribute, I worry about somebody just taking their liberties with the trail. Later that week, I got creative and packed my tools in on my bike to make some changes to the trail and the new drop feature before being done for the season. It was a pretty interesting little pack with bungy cords holding it all together and acting as shoulder straps. It did pretty good though, as long as I didn’t forget to duck under trees. I only made that mistake once. 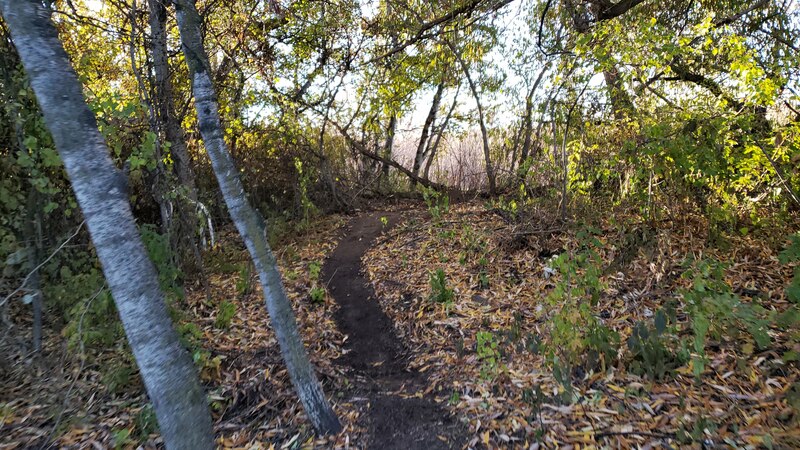 From bushes to berms to bridges, this trail has been a fun project. Usually I get pretty sick of a project after just a little bit but I keep finding myself excited about another portion of this trail. The solitude is great and the interruptions are often better. There are people that hike or ride the trail frequently that I’ve gotten to know. There’s the bunnies that get startled by me and startle me right back. There’s the sights and sounds of the early morning river. I love it all. Not only has it been my workout and my creative outlet, it’s been my meditation and my release. Everything else is just a bonus.